At some point in your journey of being a parent, you will experience your child’s first fever. While some fevers won’t cause any harm to your child, others can be a sign of something serious. In order to find out if you need to call your doctor, you will have to take your child’s temperature, especially since your little one won’t be able to tell you they’re not feeling well. If you don’t have a baby thermometer yet, it is time to get one. With our list of the ten best baby thermometers, you won’t have any trouble finding one for your family. Advanced, but still simple, this upgraded thermometer has the same electronics, but with some extras. You can still accurately check temps of children or adults. But now you can also measure the temperature in the room, of the bottle, or the baby’s bath. Measuring temperature in the room is important because the instrument should be acclimated to the air in the room before you use it. This makes it more accurate. One of the features you will love is that you can turn the beep off so don’t have to wake the patient up. That means less anxiety for you and saves you time. Your baby can sleep through the temp taking process because this thermometer makes it quick, accurate, and even silent. The digital display will tell you the results by adjusting the light color as well. Parents are loving this instrument because it makes caring for sick loved ones so much easier. This is an upgraded version of a themometer. With a few extra electronic features the additional price is perfect for this all in one and more theromemter. Can work both on children or adults. Versatility is key with products such as infant thermometers as every baby and every situation is unique. 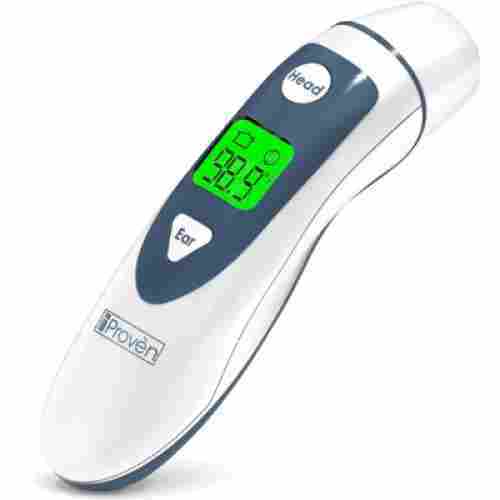 Many non-contact thermometers allow for forehead and even surface temperature scanning buy the Forehead and Ear Thermometer for Fever by Dr. Krea adds an ear canal option as well. 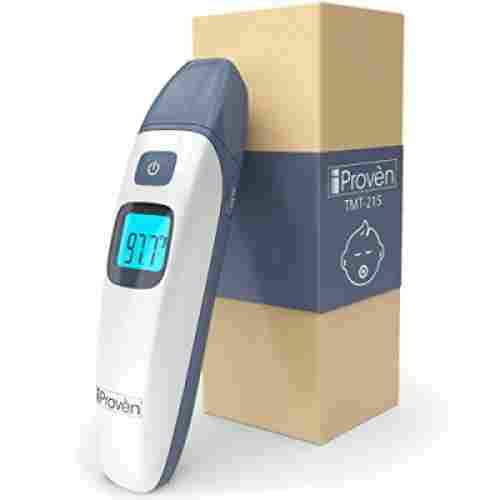 This thermometer is designed for simple and fast out of the box use. There is no complicated programming required, simply insert the included batteries, press the power button and begin measuring. 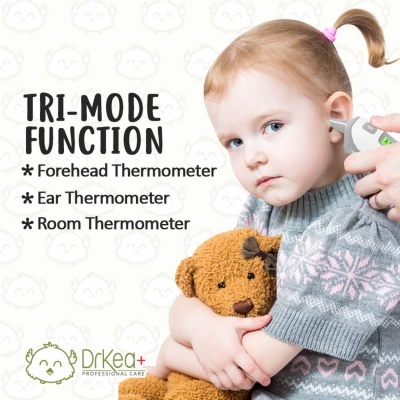 The thermal probe can be used in body mode to take your little one’s temperature from their forehead or temple. This thermometer utilizes infrared to provide an accurate temperature reading within 1 second. The large LCD screen displays the reading in large, easy to read font which can display in both Celsius and Fahrenheit. 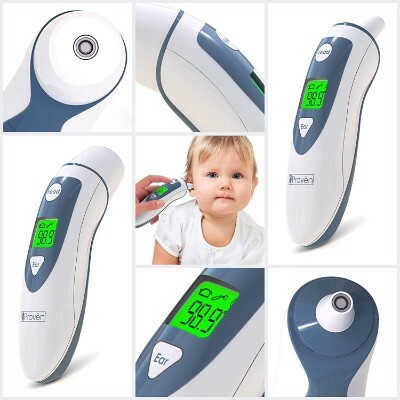 Remove the probe cover and insert the probe itself into your baby’s ear for internal readings. The surface mode can also test your infant’s bath water or formula temperature to keep them safe from overheated liquids as well. Affordable for most families. This thermometer consists of easy follow along features that will last long. The screen will also change colors to indicate if the device detects a fever. A silent mode is also available which turns off the fever alert sound and turns on the backlight for the screen, allowing you to accurately test your baby’s temperature even in the middle of the night without disturbing their healing sleep. With the iProven DMT489 you can be prepared when your child’s next fever hits. 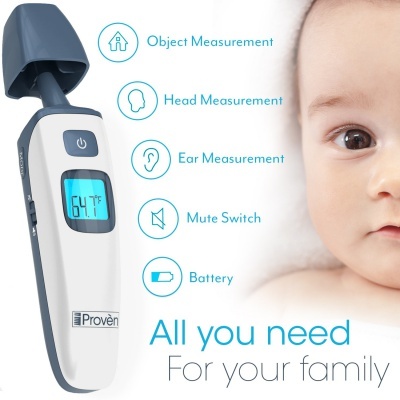 Designed with a forehead and ear mode, you can choose how to take your child’s temperature. 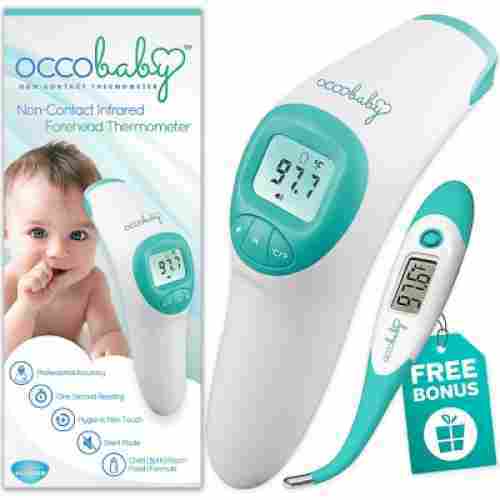 The dual functions makes this a great thermometer for children of all ages. As your taking your child’s temperature, the fever indicator will light up in green or red to let you know how serious the fever is. Green indicates a normal temperature and red indicates a fever. While medical professionals enjoy using this thermometer, it doesn’t take a doctor to get it to work. It’s super easy to use no matter what mode you’re on. The calibrated technology provides accurate results quickly. Batteries are included, thus you have everything you need to begin using it out of the box. Finding the right thermometer isn't always an easy task for parents with so many options out there. Finding the right priced thermometer is. This color changing thermometer is affordable and easy to use. 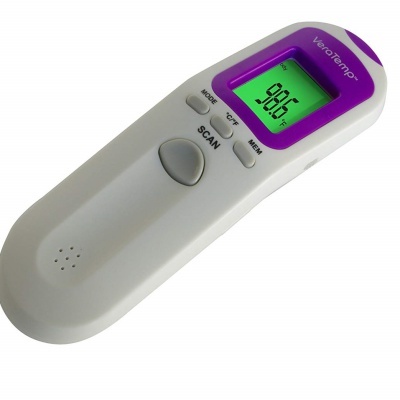 The memory feature on this thermometer allows you to save up to twenty temperature readings so you can easily keep track of your child’s temperature. 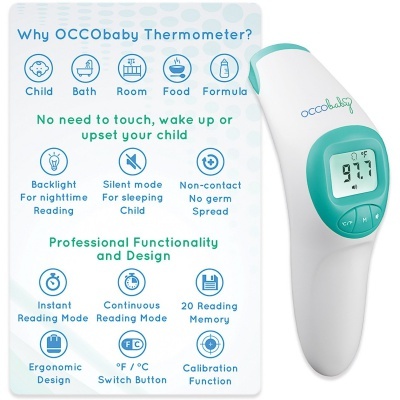 With the Occobaby Clinical thermometer, you can take the guessing out of judging your child’s temperature. There is also no need to wake your sleeping baby. 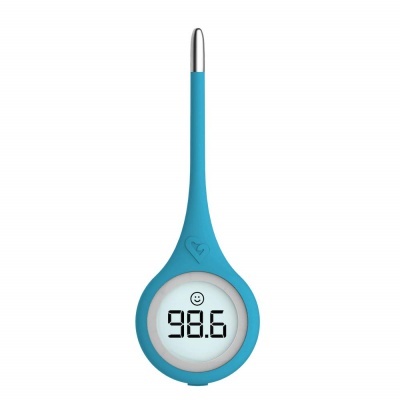 You can even use it to test the temperature of your child’s food, bath, or formula. Not only is it equipped with a silent mode, but it also has an LCD backlight so you can easily read the screen in the dark. A turquoise fabric bag is included for you to use as a storage bag for the thermometer. The compact size of the thermometer makes it highly portable, thus you can store it in your child’s diaper bag for emergencies. You won’t be waiting long as the results appear in seconds. You can easily switch between Celcius and Fahrenheit with the push of a button. You will also receive a rectal thermometer in case you need to double check the temperature reading. Affordable for what you are recieving. Comes with second thermometer just in case. Fevers can be absolutely terrifying to a first-time parent of an infant as our tiny newborns are still so fragile outside the womb. A few degrees of fever that, as an adult would simply mean a trip to the pharmacy at worst, can end up in ER visits or even more serious results with a baby. A color-changing screen and beeping noise will alert you to any fevers over 100.4 degrees as you can your little one’s forehead or temple. You can also set the device to surface or room mode in order to check that their bathwater or the ambient temperature of their room is safe. Readings display is less than 1 second and a silent mode is available to turn off the fever alert and turn on the backlight of the display making midnight fever checks quick and painless. Getting an accurate temperature reading is very important to know whether your little one simply needs fluids and rest or a trip to the doctor and that is where the VeraTemp Non-Contact Thermometer steps in. This is a reasonable priced thermometer and easy to use. The design is simple and the readings are accurate. This advanced temperature-taking device by Brooklands allows you to get an accurate reading from up to 3 inches away from your baby which is a perfect way to avoid false readings as your little one twists and squirms. Your child is always top of mind in the concern department, but when she’s under the weather, you take special care, and you’re more anxious. You need to make decisions about when to see the doctor and what actions to take. To do that, you need all of the applicable information possible. Can be used rectally, orally, or under the arm. And it comes with an extra battery just in case you need it. Reasonably priced and will last a long time. 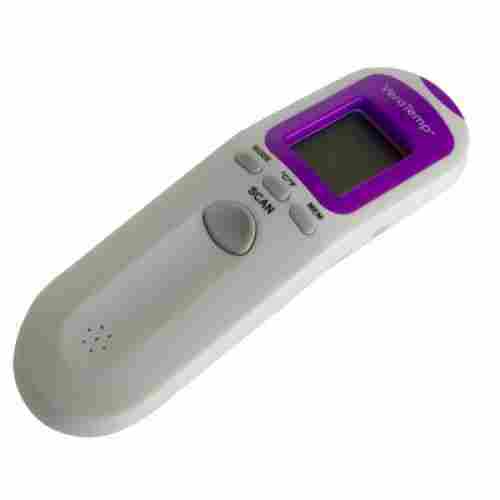 You will find your worries calmed while using this instrument as it is very easy to use, to switch between Celsius and Fahrenheit, and to see the digital readout. There is a soft, flexible tip for safety so you don’t have to feel scared for your baby’s safety. And you will find this little gem to be waterproof for easy cleaning. A technically advanced digital thermometer. Who knew? You can use this instrument with its app on your phone or by itself as a regular thermometer, without the tech. Users say this tool gets results very fast, within about 8 seconds, and the app stores the numbers as well as other symptoms to give parents some idea of what may be wrong. Uses a wireless bluetooth connection to your phone. You can enter your child’s symptoms, like a cough or stomach upset. This could be a time saver for the busy Mom or Dad so they can be with their child and have a reminder of when to give medicines. This is a wonderful app for new parents who don’t know what to do, as it gives them the steps. And if you need customer service, they are only a text away. Add in the medications you are giving, and the timer advises you when it’s time for the next dose. Plus, for your child, he can pop the bubbles on the screen to make this task more fun. Semi-inexpensive. This app will be able to connect right to your phone where you can even enter your child's symptoms and determine their sickness. It's perfect for any new parent to be who might not know what they are doing right off the back. The app will guide you through the process of taking care of your little one so you don’t have to worry about what to do next. You can be the caregiver, love your kid, and get her to a point of wellness. Utilizes a patented, pre-warmed tip for maximum comfort and accuracy. Used in the medical field by doctors and pediatricians for years. ExacTemp Technology makes this the most accurate thermometer on the market. A larger LED screen makes temperatures easy to read. The flexible tip molds to the ear canal for comfort and accurate readings. The calibration is very sensitive, so follow the set instructions diligently for a proper set up. 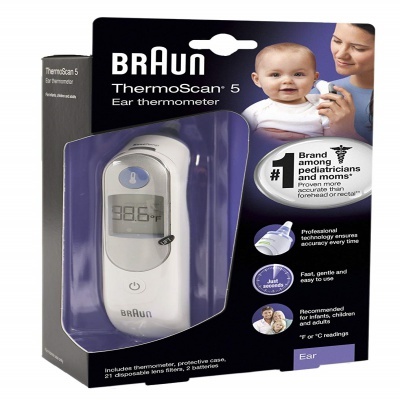 With a patented pre-warmed tip, the Thermoscan5 Ear Thermometer is one of Braun’s most sought after baby thermometers. The pre-warmed tip allows for the more accurate reading of baby’s temperature and has been a mainstay in many doctors’ offices all over the world. It has a large reset button and an even larger LED screen with easy-to-read temperature readings. Not only is it pre-heated for comfort, but the preheated also aids in overall accuracy. If the tip were cold, they’d be a sort of temperate shock from placing a relatively cold item next to a warmer item. This normal adds variance to temperature readings, but the pre-heated tip takes care of all that guess work. 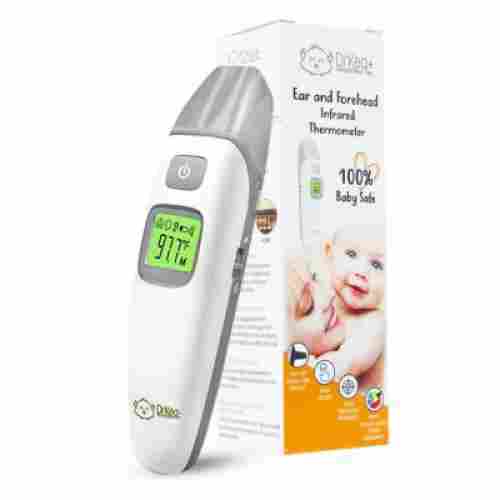 It features the ExacTemp technology which combines precision placement into the child’s ear with the closest and most accurate temperature readings you can ever find from a baby thermometer. 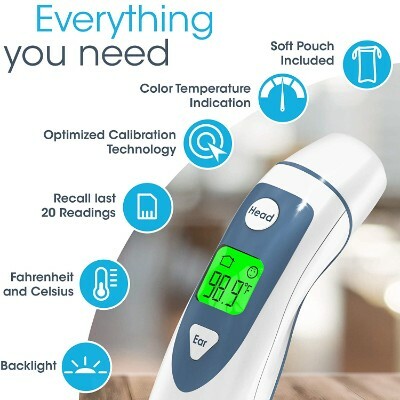 Found in many doctor offices, this thermometer is perfectly priced so that you can use it in the comfort of your own home. The tip is also flexible to allow it easy access to any shape of ear canal. To improve the accuracy of the temperature reading, a patented and BPA-free lens filter can be fitted onto the thermometer tip to prevent ear canal temperature fluctuations from affecting the final reading. 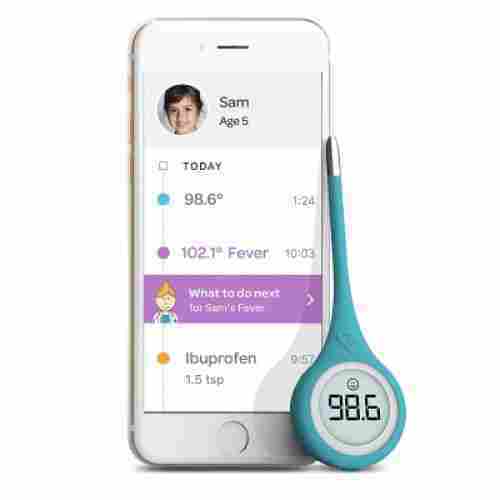 This thermometer can talk to you and tell you your child’s temperature. Features the reading in either Fahrenheit or Celsius. The speaking function can be muted for bedtime or quiet time. Can store up to 12 temperature readings for medical purposes or so that you can simply recall your child’s temperature. 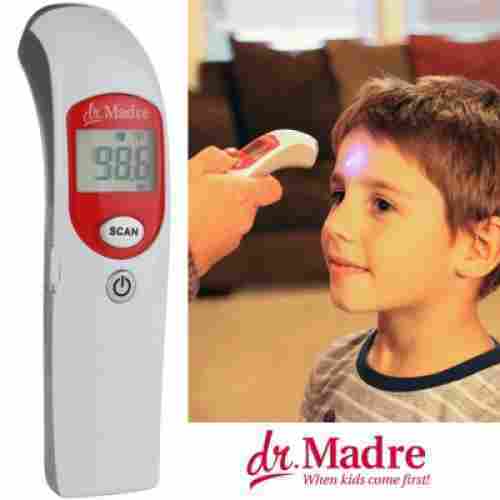 This no contact thermometer can simply read the temperature of your child’s forehead without becoming invasive. Only speaks in English and Spanish. 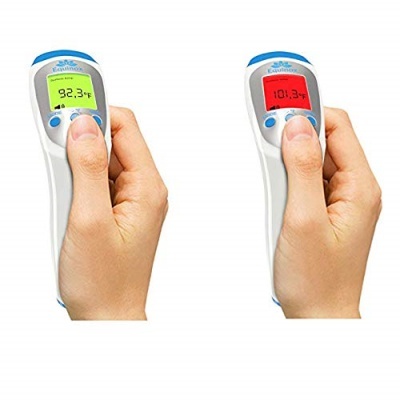 If reading the temperature readout is a challenge, then you need the Non-Contact Forehead Medical Infrared Thermometer. This Dr. Madre creation actually talks. It voices the temperature reading either in English or Spanish and either in Celsius or Fahrenheit. 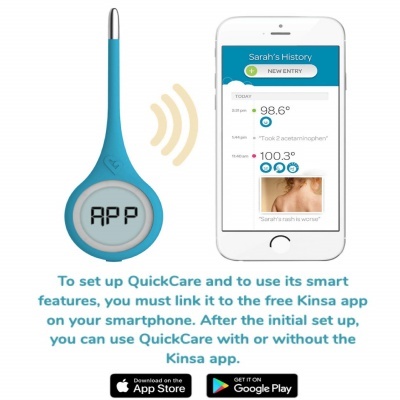 It’s also very easy to use as it only requires a click of a button and you now have the most accurate temperature of your baby. The lack of contact required for use also reduces the amount of germs spread between users. The size of this thermometer allows you to keep it in your child’s nursery or take it on the go. 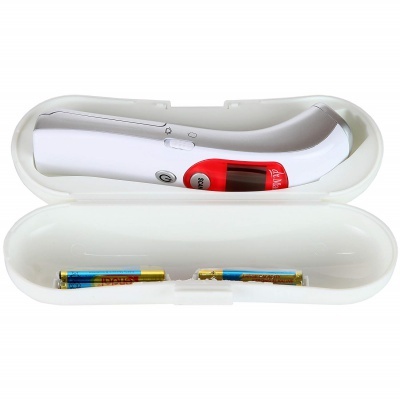 The included case will keep your thermometer in pristine condition so you can use it for years to come. At night, the talking function can be turned into silent so as not to disturb baby’s sleep. The thermometer can also be used to take room temperature. It can store 12 temperature readings in its memory. 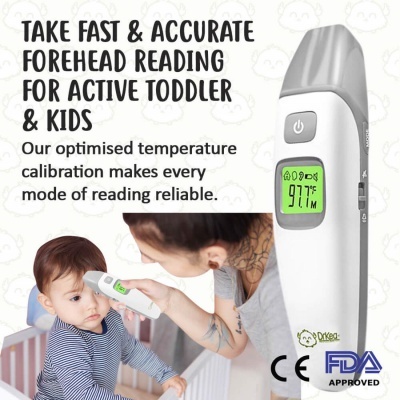 Versatile and easy to use, the Equinox Digital Forehead Thermometer utilizes infrared technology to allow it to record temperatures from up to 5 centimeters away from your little ones. Room mode also allows you to record the ambient temperature of your baby’s nursery which can be especially useful during months of extreme temperature changes. An easy to read LCD screen display ensures accurate and fast readings. Internal memory stores up to 32 of the last temperatures taken, making it easy to go back and check on how your baby’s fever is progressing throughout the day. 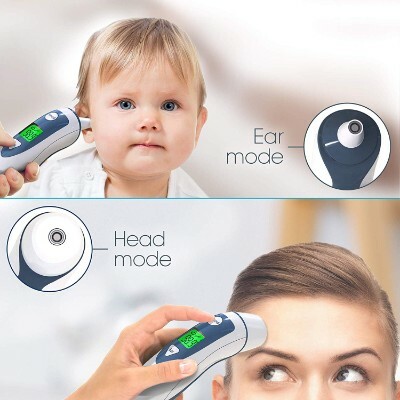 Simply place the device in body mode and rest it against your little one’s forehead to receive almost instantaneous readings that will change color and beep to alert you to a fever. The surface mode can also accurately measure common objects such as food or formula so that your little one won’t burn their delicate tongue or mouth. This thermometer might be a little bit more expensive. That being said, this thermometer is the all-in one device- that should be in anyone's toolkit. 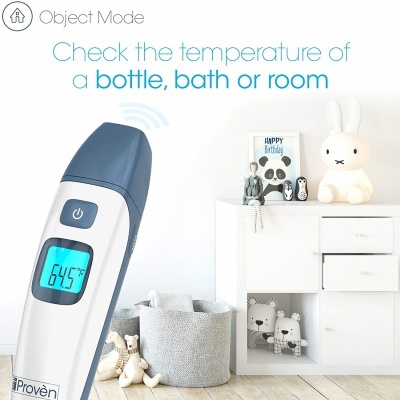 The thermometer features a color-changing screen which will change from green to orange to red to quickly indicate whether your little one, the room, or the object you are scanning is too hot. Because baby thermometers are vital to the safety and health of children, we were rather strict with our evaluating criteria. As always, safety is the most important aspect of ranking and rating these thermometers. No mercury thermometers or other harmful thermometers are included on this list, and each thermometer has inherent safety features that will be discussed in the Safety section. Accuracy was our second biggest concern. This is because a thermometer is only as good as its rate of accuracy. We included numerous types and models of thermometers with varying rates of accuracy, but all rates are safely above 97%. We discuss these rates in greater depth under the Accuracy section. Finally, our third biggest concern was comfort. It doesn’t matter how accurate or safe a thermometer is if that thermometer isn’t comfortable for the child. For comfort, we specifically looked at the construction and convenience of the thermometer. If you are thinking about the same thermometer that were used on us when we were still kids, don’t worry because those glass thermometers are clearly things of the past. Today, everything is digital. 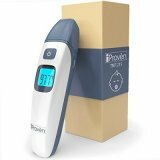 Unfortunately, as there are so many products that claim to provide the most accurate temperature readings, it is very important to choose which ones are truly the best.It is for this reason that we came up with this top 10 list of the best baby thermometers. We had to carefully examine each product to determine their accuracy as well as ease of use. We also had to take into consideration whether it will be comfortable for baby as any undue stress can only elevate the temperature even further. We then looked at any sign of certification or recognition from accredited government agencies as well as professional organizations as these are often indications of quality. The different features of the thermometers were also taken into consideration as well as the reviews and feedbacks of parents like us. Because a thermometer is only as great as its accuracy, we selected thermometers with accuracy rates exceeding 97%. It’s also for this reason that we included numerous types of thermometers. 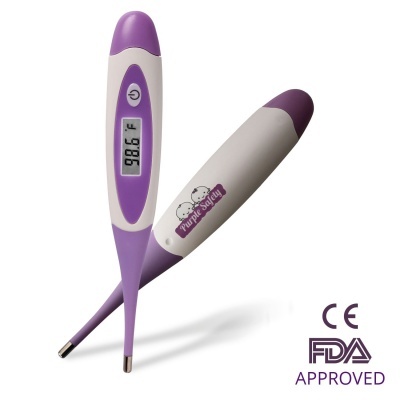 Rectal thermometers are the most accurate measures of temperature, while the mouth and ear method are the least. Though these different types of thermometers have varying accuracy rates, all of the thermometers on this list are greater than 97%. With that being said, no matter how accurate a thermometer can be, it can never be equal to 100% accuracy. The closest you can get to perfect accuracy is in a medical setting. 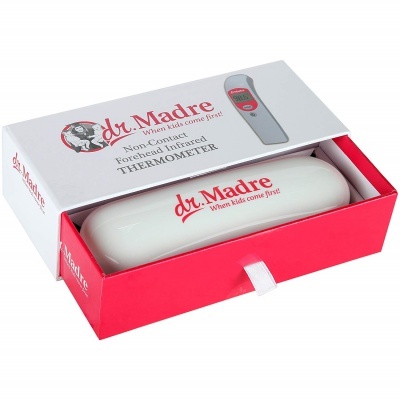 We included various thermometers that are reasonably priced for families. There are even thermometers on our list that can be found in your infants doctors office. Each thermometer is durable, long lasting and a wonderful investment and accesory to have on hand so that you can make sure that your child is safe and healthy at home. For the safety of all children, we included numerous types of thermometers on this list. This is because what might work best for newborns might not be safe for older children. For instance, rectal thermometers are great for newborns because they won’t protest as much as an older child would. But oral thermometers, while great for older children, are a choking hazard to babies and newborns. We also abstained from mercury-based thermometers. This is because mercury-based thermometers have been linked to tons of health issues such as nerve damage, mental impairment, and seizures. Finally, we have comfort. Though this is the last aspect we search for in thermometers, that doesn’t mean comfort is any less important than accuracy or safety. 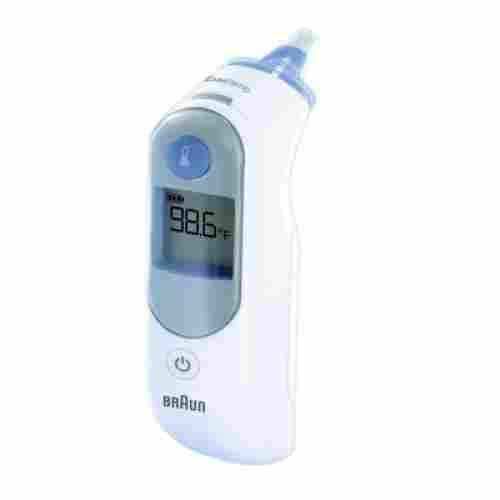 All of the thermometers on this list are designed for both the comfort of the parent and child. 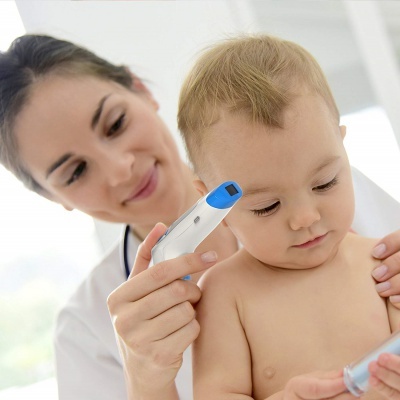 The construction of the thermometer is meant to fit comfortably in the hand and also to take the temperature of the child in a comfortable and non-painful way. Even the more invasive options, such as the rectal thermometers, come with features such as guards to ensure comfort and safety. If you are thinking about the same thermometer that were used on us when we were still kids, don’t worry because those glass thermometers are clearly things of the past. Today, everything is digital. Unfortunately, as there are so many products that claim to provide the most accurate temperature readings, it is very important to choose which ones are truly the best. It is for this reason that we came up with this top 10 list of the best baby thermometers. We had to carefully examine each product to determine their accuracy as well as ease of use. We also had to take into consideration whether it will be comfortable for baby as any undue stress can only elevate the temperature even further. We then looked at any sign of certification or recognition from accredited government agencies as well as professional organizations as these are often indications of quality. The different features of the thermometers were also taken into consideration as well as the reviews and feedbacks of parents like us. Nothing worries Mom and Dad a lot more than feeling baby hot and flushed. Couple this with the knowledge that babies’ immune system and thermoregulation are not yet fully mature and parents can be seen scrambling for answers as to why their babies feel hot. Is it fever? Or is it just Mom and Dad’s apprehension that is making them feel baby is warmer than usual. >There are many reasons why babies have a fever. In most cases, it is often an indication of an infection. Among babies, the most common infections are those caused by viruses and the fever, if any, should readily subside within three days. It is clear that the temperature we should all be watching out for is the 38oC or 100.4oF mark. As such, we should all be competent in taking the body temperature of our kids. There are four different methods of taking the temperature of children. These include the use of rectal thermometers, axillary thermometer, oral thermometers, and tympanic thermometers. For young infants below the age of 3 months, there is only one method that is considered to be highly accurate-–the rectal method. For infants older than 3 months, tympanic and axillary thermometers are considered acceptable. The use of oral thermometers are generally reserved for older children preferably at least 4 years old. Understand that rectal thermometers are the most accurate, albeit quite inconvenient. It provides a very accurate measurement of the body’s core temperature. Axillary, tympanic, and oral thermometers are susceptible to temperature fluctuations of the surfaces upon which the temperature probe is in contact with. These thermometers only provide an estimate of the internal body temperature. Thebgood thing, however, is that these methods provide convenience for Mom and comfort for Baby. Unfortunately you won’t really be able to gauge your baby’s temperature very accurately. Today’s thermometers are very easy to use because everything is already digital. There is no more need for trying to figure out the mercury readings in old mercury-filled glass thermometers of old. Today, it’s as easy as following the manufacturer’s instructions and keeping the probe as clean as possible. You only need to place the thermometer in the intended body part, wait to hear its beeping sound, and then read the digital display. It is important to keep a record of your baby’s temperature readings so you will have an idea whether his or her fever is decreasing or not. At the very least, you will have something to show your baby’s pediatrician should you decide to bring your baby to the clinic. This will help in the planning of your baby’s care. Fever in very young children can scare even the toughest Moms and Dads. That’s why we have listed the top 10 baby thermometers so you will feel more empowered to care for your baby. q: What kind of baby thermometers are there? Oral Thermometers: These are one of the most common thermometers and they have a rather high accuracy. These thermometers can be placed under the tongue for temperature taking. Though they are not as accurate as rectal thermometers, they are much more comfortable for children to use. Smart Thermometers: These thermometers can be integrated with phones and other smart devices for constant updates and cataloguing of your child’s health. They usually come with patches that read your child’s temperature, and then the information is sent to a smart device. Axillary Thermometers: These thermometers do not have to be inserted into your child, but simply placed in the armpit. Though this method isn’t as acute, it’s more comfortable and convenient for both child and parent. Axillary thermometers are usually recommended for sleeping children because the method won’t disturb their rest. Ear Thermometers: As the name suggests, ear thermometers take a child’s temperature through the ear canal. This method is more accurate than the axillary thermometers but still less accurate than the rectal thermometers. Temporal-artery Thermometers: The newest kind of thermometer, temporal-artery thermometers use infrared technology to gauge the temperature of a child’s forehead. This method is the most comfortable, but it’s also the most expensive. 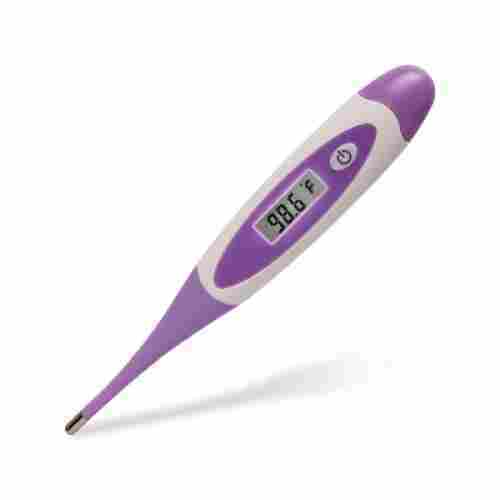 This type of thermometer is also only for children 3 months and older. Rectal Thermometers: The most accurate thermometer, rectal thermometer is recommended for children of all ages. However, this thermometer can be the most uncomfortable and dangerous if not used properly. When using the rectal thermometer, please be sure to properly clean and lubricated the device. Rectal thermometers are best for taking extremely sensitive temperatures. 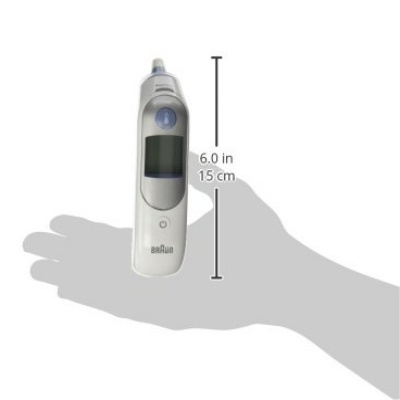 Multi-use thermometers: These thermometers can be used orally, rectally, or axillary. They are one of the least expensive types of thermometers, but they must be thoroughly cleaned after each use. Multi-use thermometers also give some of the most accurate readings, especially when used rectally. q: Which type of baby thermometer is best for my child? Which type of baby thermometer is best for your child completely depends on the individualistic needs of the child. Most children do well with all these thermometers with the exception of the rectal thermometer. If your child needs highly accurate temperature readings, then rectal thermometers are the best option. However, rectal thermometers shouldn’t be used past the age of 2 years unless a doctor is performing the reading. q: When is it appropriate to use a thermometer instead of my hand? We know that most parents generally use their hands as their first thermometer, and this practice is completely fine. Our hands are very sensitive and can tell us a lot about our child. If your child is showing obvious symptoms, such as vomiting, diarrhea, lethargy, coughing, etc., then you can probably go straight to a handheld thermometer for accurate readings. q: What are some general safety tips for a baby thermometer? Some general safety tips for a baby thermometer include: keep the thermometer in a safe and secure location, keep the thermometer clean after every use, never leave your child alone with the thermometer, never take your child’s temperature less than one hour after a bath and less than three hours after a full meal, and take multiple readings whenever possible. q: What features should I look for in a baby thermometer? Above all else, consider the needs of your child first before buying a baby thermometer. Your child’s age will ultimately decide which thermometer works best for them. After consulting your child’s age, look at the different types of thermometers. Most parents opt for a multi-use thermometer because they are both accurate and multifunctional. q: Are rectal thermometers safe? Yes, rectal thermometers are extremely safe. They also give out the most accurate readings. If you’re concerned with using a rectal thermometer on your child, understand that you don’t have to use a rectal thermometer. Even though they are the most accurate, other thermometers give you pretty accurate readings as well. q: How can I get my child to sit still enough to take an accurate temperature? q: Can I use a mercury thermometer? No, mercury thermometers should never be used. Mercury thermometers were popular in the '70s and '80s because we didn’t know the health risks associated with mercury. If you’re using a mercury thermometer, dispose of it properly in favor of a digital one. While mercury vapors are the real danger, we just don’t want to take any risks when it comes to our children. q: How do I properly clean my baby thermometer? How you clean a baby thermometer depends entirely on the kind of thermometer you have. For the most accurate methods, clean the baby thermometer in accordance with the written instructions provided. Most of the time, a thermometer can be cleaned with gentle soap and warm water. Some thermometers, in fact, can be placed in the dishwasher for sanitation purposes. q: How can I tell if my baby thermometer is broken or giving inaccurate readings? Sometimes, it can be rather difficult to tell if a baby thermometer is giving you the wrong reading. If the baby thermometer is flashing a digital reading that seems either way too high, or way too low, then it most likely is giving you an incorrect reading. Also, if you notice the LED screen petering out or flashing with a pair of fresh batteries, then it’s time to invest in a new one.